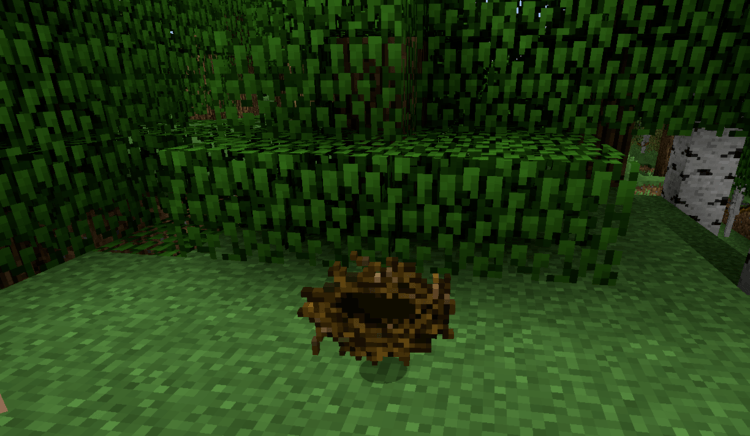 Birds Nests Mod 1.12.2/1.11.2 for Minecraft adds into the game a new item called Birds Nest (similar to Lucky Block from a mod of the same name). The Birds Nest can randomly drop rewards whenever players are chopping trees. Chopping trees is not necessarily a boring or annoying job, but the creator of Bird Nests still wants to make it more interesting by randomly giving out items when cutting trees. The new item is the replica of the real-life bird nest. When cutting trees, leaves will disappear gradually, and there is a fixed chance of the tree dropping out a birds nest. Right click to claim the item inside. The mechanism is easy to understand. Bird nests are built on tree branches, and when the tree is cut, the nest will fall to the ground. However, it is not like there are bird nests on every tree, so there is a random chance of finding a bird nest. Items that can be found inside bird nests are things that they eat or sparkling items that birds love to collect. Note that all mod’s parameters, even the items inside the nests, can be adjusted in the config file of the mod. You can download the latest version of the Birds’ Nests mod from the link below and follow the instruction to install. Remember to check if the mod needs any additional mod to run. Happy gaming! Download Forge Installer, Birds-Nests.jar file.